The AMS DMX 15-80S is a true stereo microprocessor controlled digital delay line. Originally designed to meet specifications laid down by the British Broadcasting Corporation for equipment to be supplied to them, it offers two completely independently delayed channels with precisely controlled delay times. The delay times are adjustable without any sacrifice in the 18kHz bandwidth which remains constant irrespective of the amount of decay selected. A total delay of over thirty two seconds is possible with this unit, plot over the two channels. The design of the AMS DMX 15-80S is highly modular, allowing incorporation of new technologies and techniques; thus the system will not be rendered obsolescent as developments take place. The design employs effective 15 bit digital encoding, achieved by basic 12 bit conversion with three instantaneously sweetened gain ranges of 6dB each. This allows a 90dB dynamic range without the use of analogue compression/expansion techniques with their inherent distortion problems, such as noise breathing. Memory back up is supplied as standard to ensure that entries to the microprocessor are not lost on power down. Both input and output levels are adjustable to accommodate units sending or requiring non-standard signal levels. An intelligent, glitch splicing pitch change option is available which can be incorporated on either or both channels. It will allow pitch shifting as much as one octave either side of the original frequency. If the pitch shift option is incorporated, the ‘lock in’ function, which normally just allows indefinite storage and playback of both delay line contents (without deterioration), is transformed into a tape loop editing system. The then ‘locked-in’ audio may also be audio triggered if required. 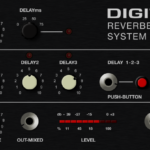 An ‘add-on’ digital reverberation system is also available. This add-on unit, the DMX15R, is physically the same size as the AMS DMX 15-80S. It provides nine preset programs with an 18kHz bandwidth, 90dB dynamic range and typical distortion of 0.03%. Independent control of variables, such as pre-delay, decay times, high frequency decay profile and low frequency decay profile, is also provided. Regeneration controls are provided on both channels of the AMS DMX 15-80S and the input may be switched to allow single line input (channel ‘a’ feeds both delay lines). A switch is also provided to allow the outputs to be mixed for special effects. An important feature of the dmx range is the use of ‘Nudge Buttons’. These buttons when used will cause the delay to sweep up or down in steps of only 25uS making the sweep virtually silent. A facility for switching channel ‘a’ in phase or out of phase with the original and channel ‘b’ is provided. A reset switch is provided for initialising the computer. A computer store clear instruction is also provided. A flight case is available for the AMS DMX 15-80S if required. Flight cases that accommodate multiple of AMS systems are also available. The unit is engineered to the same high standard as the rest of the dmx range and offers similar microprocessor controlled form panel facilities i.e.. programmability, repeatability and storage capability not available with other forms of data entry, putting the engineer in complete control of the system functions. The AMS DMX 15-80S is designed as a rack mounting unit 3.5″/2U high and 11″ deep, excluding knobs and connectors. The choice of components and quality of construction are of a high standard and because of the choice of mother board system with plug in circuit boards and ribbon cables, maintenance problems are reduced to a minimum. There is no doubt that the AMS DMX 15-80S’s small size and rugged construction, coupled with the unquestionable performance characteristics represents the best value in delay line technology available in the world today.